Rogue Cartoonist: "A Change in The Weather"
I applaud President Trump for withdrawing from the Paris Climate Accord. It sends a clear message to doubters that he is indeed not in the pocket of the Illuminati like all of the presidents since Kennedy have been. As to be expected, the outcry was immediate and incredulous. He fielded criticism from Al Gore, the Pope, Lloyd Blankfein, Merkel and many others. Leonardo DiCaprio said, “Our planet was threatened by Trump’s careless decision.” Notice how he doesn’t use the word ‘Earth.’ Instead we're just another planet out there—such as Mars—and its ready to have our atmosphere ripped away. Hey Leo, stick to acting and sucking in millions of bucks so you can leave huge carbon footprints with your private jets. Your pompous fear-mongering and hyperbole aren't convincing. George Soros, who has spent what has been called a "staggering amount of money" to influence (hack) our elections in favor of his selections, also spent $30 million on Al Gore’s global warming programs, which aim to lobby carbon taxes to further impoverish and control U.S. citizens. It’s about more money going to the central bankers and global business interests at top of the pyramid. 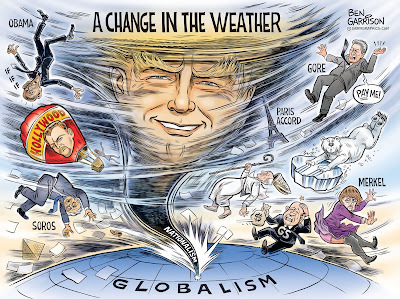 It’s about those at the very top conditioning minds so that they’ll readily accept global ‘governance,’ which means a one-world collectivist dictatorship run by slave masters. The end game for them is making everyone poor and dependent on government. This also means digital currency, mandatory vaccines and the further erosion of liberty. Eventually it means a culling of humanity. The climate change narrative is being run by con artists such as Gore. They spew out the best distorted data money can buy. It’s bunk. There’s no reason we can’t have clean-burning coal and natural gas. Both are in copious supply. There’s no reason we can’t have industry and well-paying jobs returning to America. But as George Carlin once said, ‘The real owners don’t want that."